You can activate a questionnaire or a consent form as needed. Activating a form makes it available for all patients to complete online. Questionnaires come pre-defined, so the fields that are available and the names of fields on forms cannot be edited. You can customize the text of consent forms. Each questionnaire, including its activation status, is organization specific. Each consent form, including its activation status, is location specific. On the Settings menu, under Location, click (or tap) Patient Forms. The Patient Forms page opens. 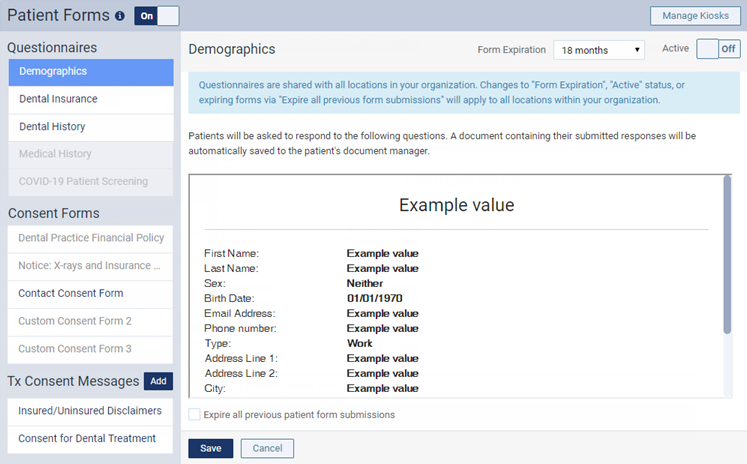 On a location's Patient Forms page, under Questionnaires or Consent Forms, select an inactive form (the name will be in gray text to indicate that it is inactive). The options for the form become available. Set the Active switch to On. From the Form Expiration list, select how long after a patient completes this form that the form will expire and need to be completed again. When are patient forms sent?